The Old Foodie: Dialectical Difficluties. Dorothy Wordsworth, sister of the poet William Wordsworth, lived with her brother for a number of years in Grasmere in the English Lake District. She kept a diary, and occasionally noted a meal or a cooking session. On this day in 1800, her note was brief. Hasty pudding is pudding, hastily made. It is a flour of some sort stirred into a liquid of some sort and boiled until it is thick, and it appears in every cuisine that is grain-based. It is porridge if it is made with oats, polenta if it is made with maize, and in medieval times it was frumenty if it was made with wheat. Depending on the availability of enhancing ingredients, it can be improved with cream or eggs or spices or ale or wine or fruit or … Well, you get the idea. My ranging across centuries of cookbooks confirmed for me what I had already suspected - Hasty Pudding is an idea rather than a recipe, and a not very interesting idea at that. One recipe did somewhat puzzle me however (and not because it is made with bread instead of grain), and set me off on a linguistic rather than a culinary search. It is from a Scottish cookbook of the same year as Dorothy’s diary entry, by a ‘Mrs Frazer’, and called The practice of cookery, pastry, confectionary, pickling …. Prepare as much bread and milk in a small bowl as will fill an asset, and put in a piece of fresh butter in it; pick and clean a handful of currants, and boil altogether, cast four eggs and put them in it; season with cinnamon, nutmeg, and sugar. After the eggs are in, stir it on the fire till it thicken, but don’t let it come a-boil; then butter a bowl, and put the pudding in it; set it before the fire, or in an oven, and when it is fastened, turn it out into the asset, and serve it up. Fill an asset? I thought an asset was something that filled something else – your house or jewel case or coffers, not something that itself required filling - by pudding. England and Scotland have always had an uneasy relationship, and part of the blame for this must lie on the language gulf. The Scots have historically allied themselves with the French against the English, and in return for their allegiance have been allowed to appropriate some French words. It turns out that asset (or ashet, ashett, aschet, assiet, ashad etc) comes from the French word assiette, and means a flat plate or dish. Hence also Ashet-pie, which is Scottish code for a pie made on a flat plate. And pie is preferable to Hasty Pudding any day in my opinion. If you don’t have a suitable asset amongst your kitchen assets, Mrs. Frazer also gives a recipe for pie that does not require a dish at all, and which also demonstrates that the Scots have retained some of their original Gaelic (did the French accept some Gaelic words in return, I wonder? I somehow doubt it). 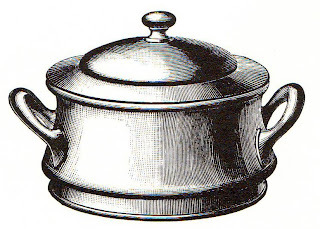 Boil two partons for half an hour; when perfectly cold, break the large claws and pick the meat out of them, also the meat out of the body, and the red roe; beat them in a mortar with four ounces of sweet butter, a few breadcrumbs, a quarter of an hundred of stewed oysters, with some of the liquor, and a glass of white wine. Then wash the back shell clean, and put a paste vandike round the edges of it; fill it with the meat, and stick bits of butter on the top. Bake it half an hour. A parton (partan, partane, perton, perten, pertine, pertein, pertian) is, apparently, Gaelic for crab. Ain’t linguistic trivia grand? Almost as grand as crab and oyster gratin. We celebrated the feast day of St. Honoré, the patron saint of bakers and pastrycooks. I like the reference to the vandike which is a collar. "Paste vandyke"? Is this a term for a decorated, "lacy", edge around the paste? "As thick as hasty pudding. "And with the girls be handy. " Hello everyone; the OED says that to vandyke is "To furnish or provide … with vandykes or deep-cut points, after the manner represented in Van Dyck's paintings; to cut or shape with deep angular indentations"; the specific references are mainly to articles of clothing, such as collars. Clearly the OED 19thC editors did not catch up with the references in old cookbooks. I didnt know the hasty pudding references to Harvard, or the song, so thanks Karen and lapinbizarre. The French words in Scots come mainly from the time when Mary Queen of Scots returned to Scotland when her husband, French King Frances II, died young. She brought back with her a large French retinue whose language influenced the Scottish royal court, and spread into more general use. The French words in Scots come from the time when Mary Queen of Scots returned to Scotland on the death of her husband French King Frances II, and brought a large French retinue with her whose languageinfluenced the Scots royal court and spread into more general use. Gourmet Eggs and Giant Eggs. A reasonable supply of Breadfruit.